Toys are too complicated these days. I sometimes hear parents saying that their kids get bored if their toys don’t make sounds or light up, or aren’t animated or interactive games. And of course all these electronic toys and games cost more and break really easily. I sometimes feel like an old fogey, but seriously, do children really need all those bells and whistles? Sometimes it’s the simplest of things that make people happy, and the same goes for the classic games that kids have been playing for generations. Make a big colored mess?! Yes, please! What fun it is to bundle them up and watch them fall all over the place, like a big moving rainbow! I think that this is one reason why pick up sticks have been a cherished game for such a long time. They’re aethetically pleasing, but also such a simple game that requires concentration and small motor agility. 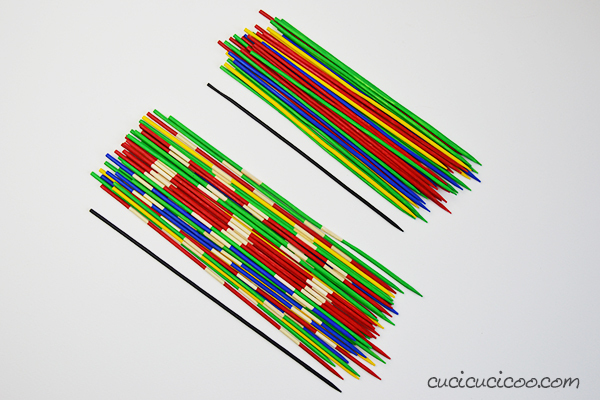 There are lots of variations on this game, but what I propose here is Mikado, the classic pick up sticks version. 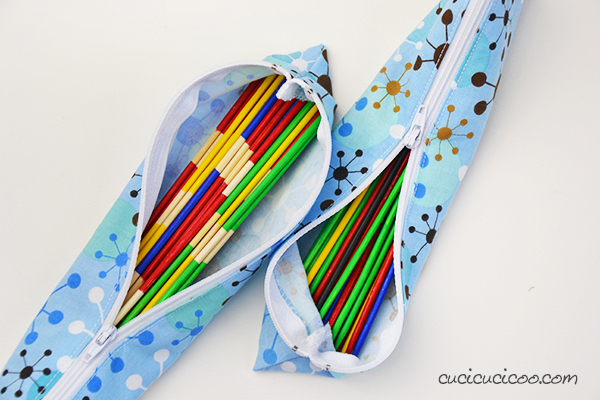 They’re really simple to make with very basic materials, and are a wonderul gift for kids and adults alike when you sew a little pouch for them and include playing instructions! And I know that you probably don’t have time to create an instruction sheet, so I’ve made one for you that you can download and print out! You’re welcome! I actually researched Mikado quite a while to find the “official” rules, colors, stripe scheme and point system, but it turns out that there are loads of different versions. I made up my own colors and stripes (I also made a set without stripes which looks more like the plastic game I had when I was little), as well as my own point system based on what I found most often. Feel free to vary any of these as you please. So, what do you say? Are you ready to have some good old-fashioned fun? 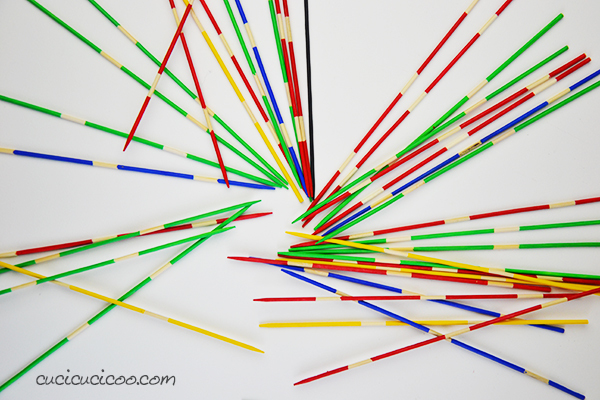 Let’s get right to work on our homemade pick up sticks! 1. 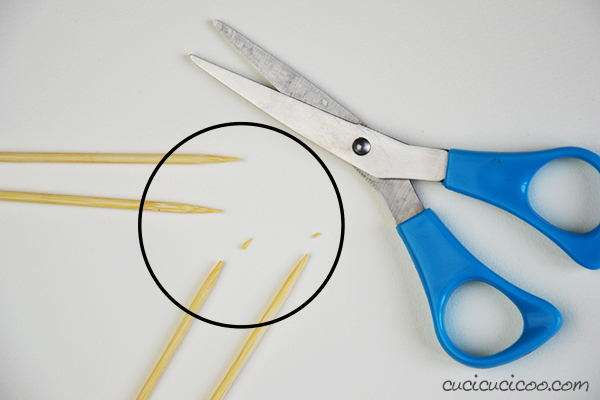 Cut off the very tip of 41 skewers. 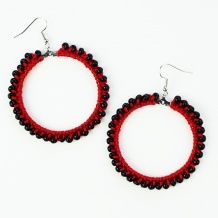 Those tips can be very pointy and we don’t want anyone getting hurt! 2. 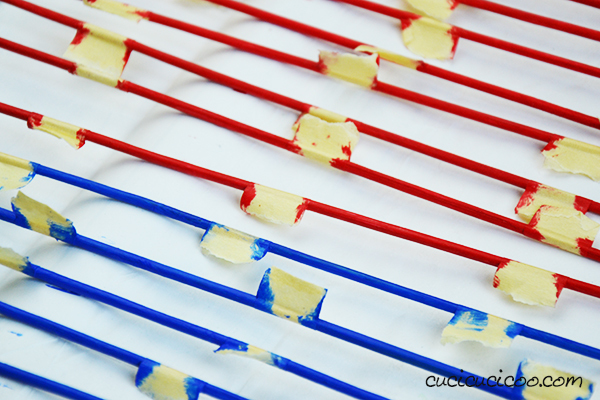 If you want striped sticks, wrap little bits of masking tape around the sticks. You can make them all the same or vary the stripe scheme. Just make sure that you keep the same scheme for each color. 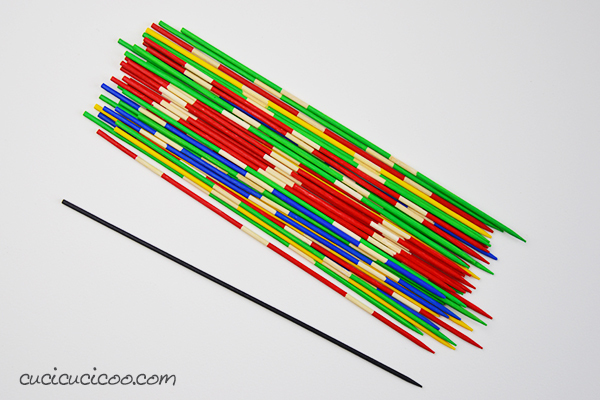 I put three pieces of tape on 20 sticks and two pieces of tape on 20 other sticks, and left the remaining stick plain for the special black Mikado stick. 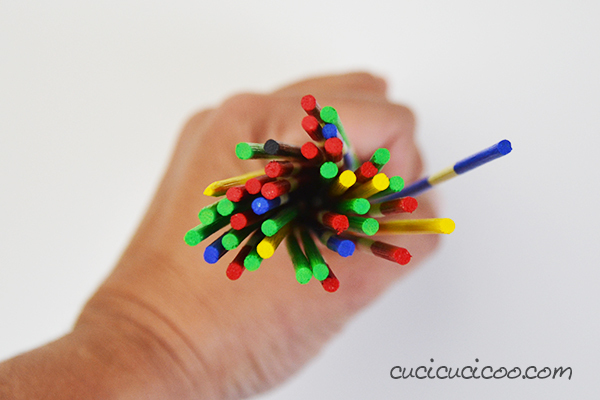 Omit this step if you prefer solid-colored sticks. Just be forewarned that it’s much easier to paint the striped sticks because you can hold on to the masking tape without having to hold onto the wet painted sticks! 3. 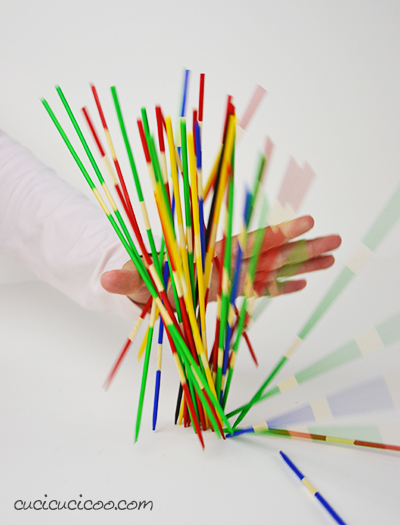 Paint the sticks according to your color scheme/point system. If you follow the one given in my printable playing instructions sheet, you will paint one stick solid black, then five blue, five yellow, 15 green and 15 red. 4. 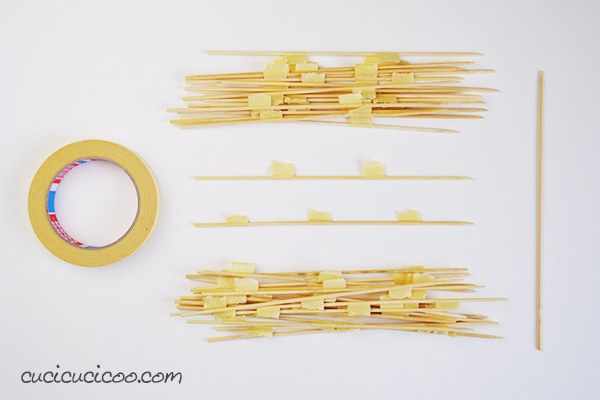 Let the sticks dry completely on the wax paper or other non-stick paper. Paint a second coat if necessary. 5. 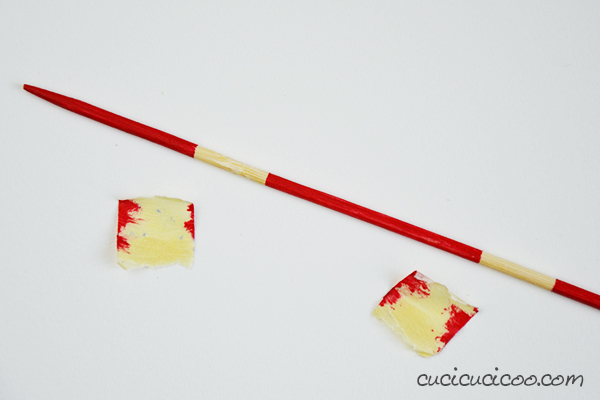 Peel off the masking tape when the paint is dry. And you’re done! Wasn’t that easy?! 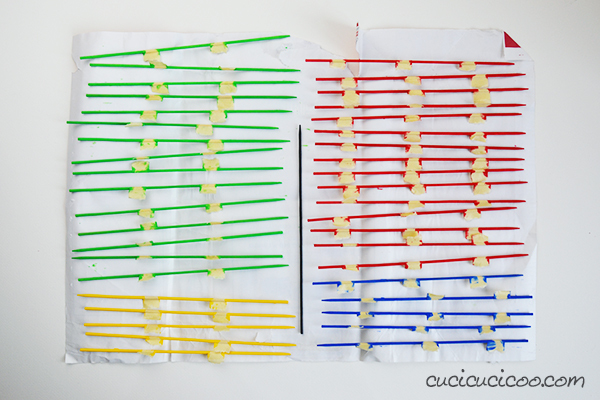 I can’t decide which type I like more, the solid-colored sticks or the striped ones. As you can see above, I accidentally bought two packages of skewers that were different sizes, but it really doesn’t matter what size you choose. I love how the different colors look, like a holding a rainbow in my hand! And I love the way they look scattered during the game, too! It’s really easy to make a little zipper pouch to carry the game in. 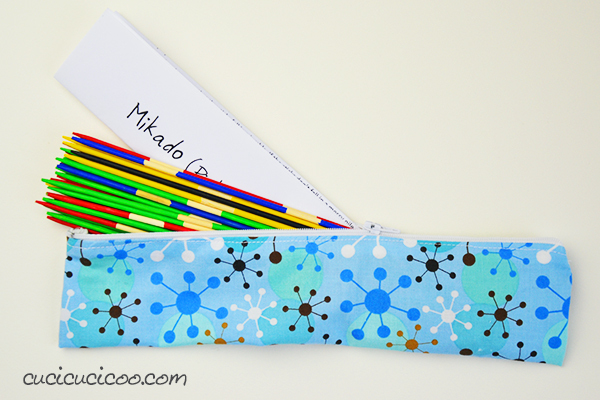 Just get a zipper 2 or 3 cm longer than the sticks and cut a rectangle of fabric as long as the zipper tape and 15 cm wide and follow my instructions here on how to sew a simple zippered pouch. 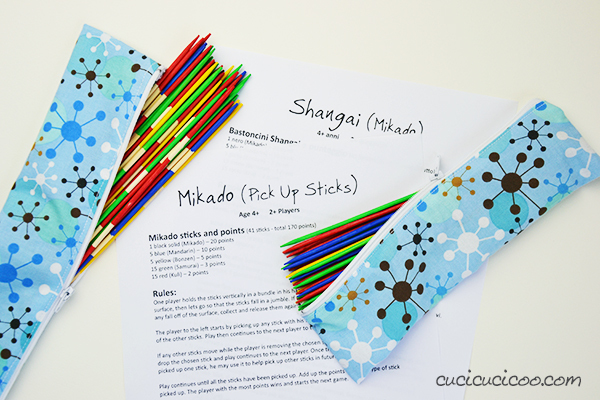 You can play with your own rules, or download and print my Mikado instructions from my free downloads page. Fold the sheet in half, then in thirds, trim off the blank margins, and it will slip right into the carrying case! In a nutshell, you hold the sticks in a bunch with the tips touching the table, then let go, which makes them fall in a jumbled heap. 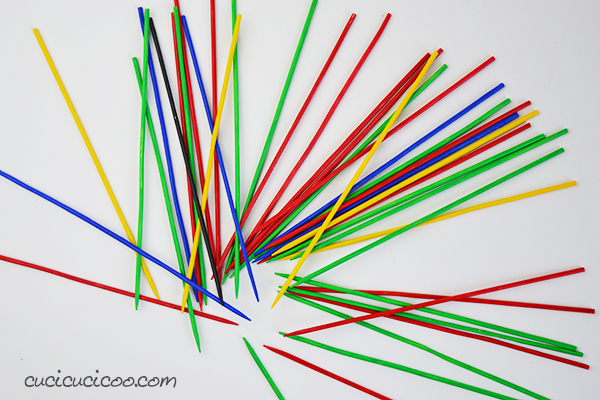 Players then take turns picking up one stick at a time without moving any of the other sticks. There are variations on the game. Some people play that you pick one stick, then it’s the next player’s turn. 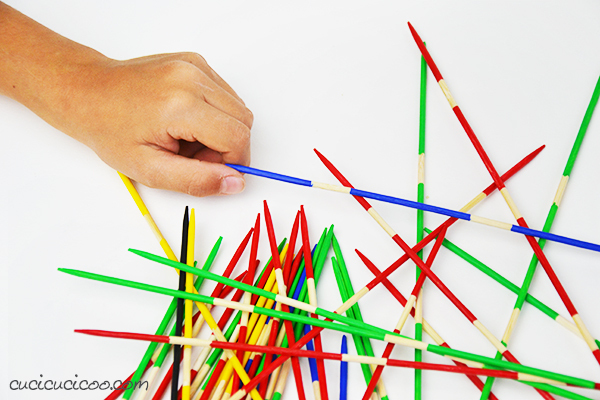 Others do it so that a player continues to pick up sticks until he moves one, and only then play passes to the next player. Some people like to re-bundle and re-release the sticks at each new turn. I’ve added a few variations on playing rules in the instruction sheet. Likewise, there are variations on scoring. Usually each color is assigned a point value and you add up your points at the end of the game. Sometimes you keep a tally of scores over five (or any other number of) games, or decide that the first player to reach 100 (or any other number) of points over various games wins. After I prepared the downloadable rules, my kids told me that at their summer camp they played that you count up the number of stripes on the sticks you’ve collected, which is an easy variation for kids. However, in this case you might want to vary the number of masking tape tabs you put on the sticks in step #2. And when you’re done playing, just stick them back in the carry case for easy storage! 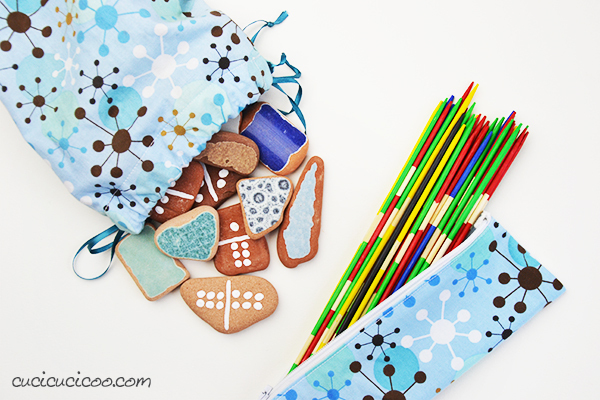 And if you want to give an extra special gift, why not make a set of tile or rock dominoes in a matching fabric carry case? There’s nothing quite like old-fashioned games with a modern twist! 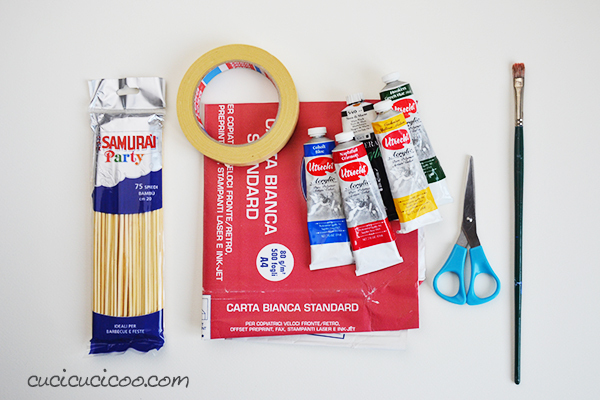 It’s super easy (and inexpensive!) 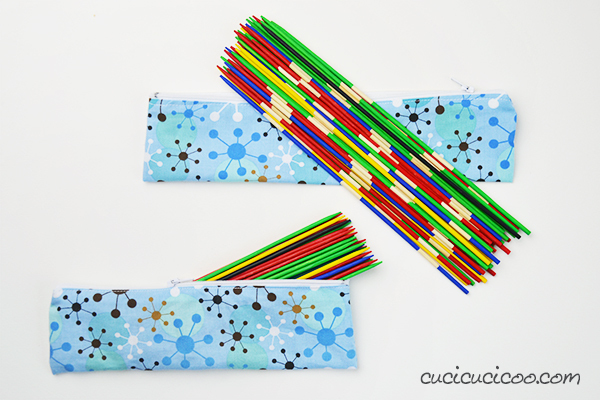 to make your own handmade pick up sticks, and you’ll be able to spend hours of fun without any batteries or electronic gizmos! So what are you waiting for? 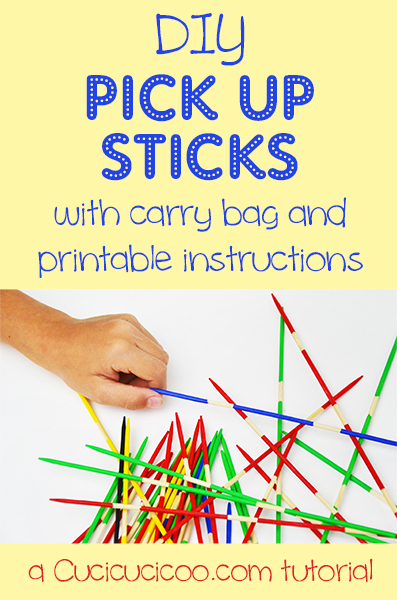 Go make a set of homemade pick up sticks for your family… and everyone else you know! 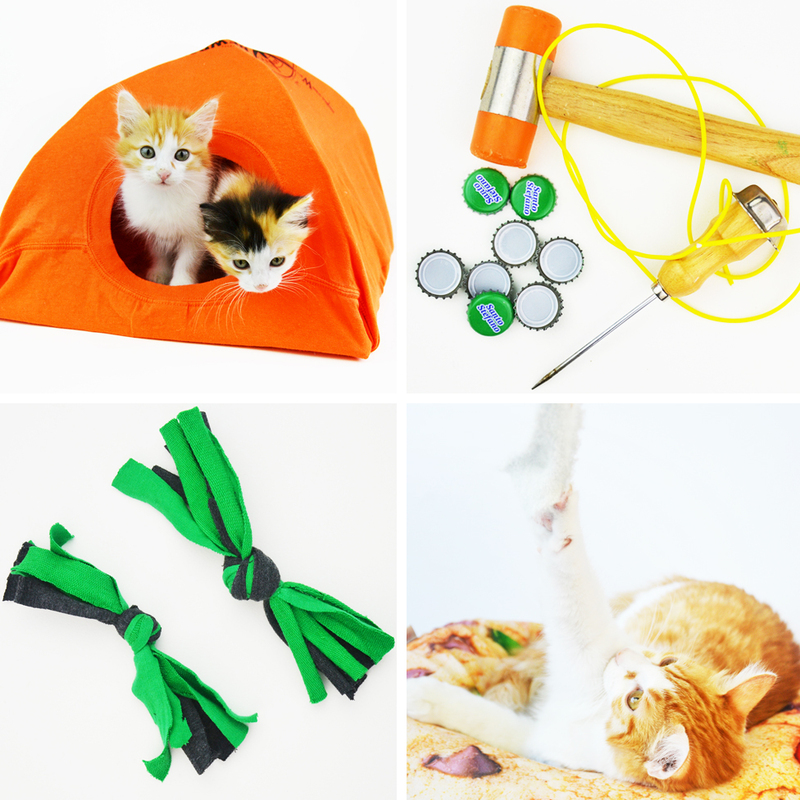 Do you love making simple, but stimulating, toys and games? 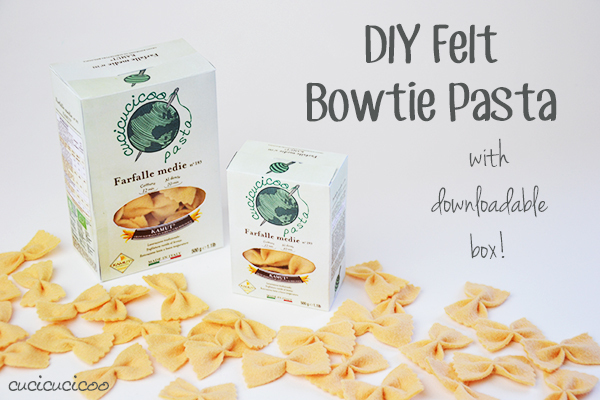 Then check out my super easy felt bowtie pasta tutorial with a free downloadable box to make it look even more realistic! I used to love playing Pick Up Sticks, Lisa. I totally agree, kids don’t need all the bells and whistles to which many of them have become accustomed. I would never have thought to make my own set. I used to love it, too, Pam! I hope you make a set and enjoy it! This is a fabulous idea! 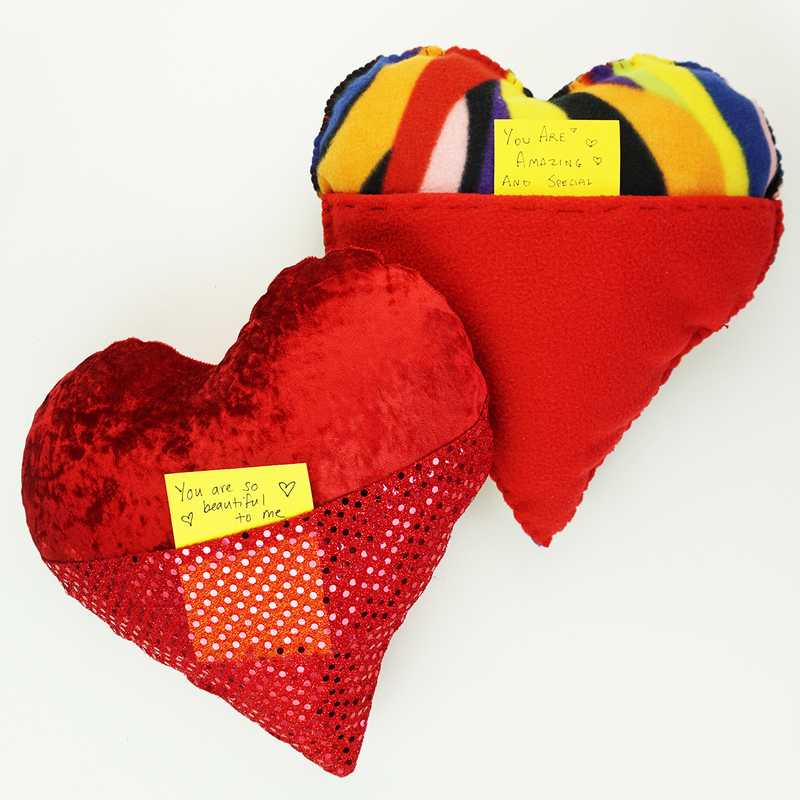 I will definitely be making these for my daughter when she gets a bit older! Pinned! So glad you like it, Lisa! And I’m sure your daughter will, too! This is such a cool idea. LOVE the striped look. And I agree, kids do not need bells and whistles! 🙂 Thank you so much for linking up to Funtastic Friday! Thanks, Kimm! I’m so glad that you like this and that you agree about simple toys and games! Thanks as always for hosting!